Maj Gen Wilson Mbadi, UPDF’s new Joint Chief of Staff (JCOS), and Number 4 in the army hierarchy, has enjoyed quite a dramatic rise to the top. Until his appointment as President Museveni’s bodyguard in 2007, Bwambale worked as a junior officer in the Chieftaincy of Logistics and Engineering. He was a captain attached to the Directorate of Barracks and Stores under Major Okori. Col Fred Bogere was Chief of Logistics, deputised by Lt Col Steven Oluka. Mbadi also served briefly in the Masaka-based Armoured Brigade, before rising to command the Alpine Brigade 507 in the Rwenzori Mountains. From there, he got promoted and was appointed President Museveni’s bodyguard. A graduate of Sandhurst in the UK, one of the world’s most prestigious army academies, Mbadi attended this course at around the same time as Brig Muhoozi Kainerugaba, Museveni’s son. At the time, few would have taken note of this young officer who hails from Kasese, but his rapid promotion over the last couple of years now shows he was always being destined for big things. A blue-eyed boy of the commander-in-chief, Mbadi has in seven years jumped from lieutenant colonel, to colonel, brigadier, and now major general. However, his most dramatic career growth has come in the last five months. On December 1, 2012, Mbadi, until then Museveni’s ADC, was promoted to brigadier and appointed 4 Division Commander. Before he has settled in Gulu, where 4 Division is based, Mbadi is now a major general and Joint Chief of Staff. His former immediate bosses, such as Col Bogere, Col Oluka and Lt Col Okori, among others, have suddenly become his juniors who must salute him. In politics and public service, that is normal, but in the army, it can be humiliating. Besides, the Joint Chief of Staff is technically the employer of soldiers. That means bush war veterans who are still serving in the army, such as Maj Gen Joram Mugume (in charge of UPDF land), Col Gyagenda Kibirango (heads casualty unit in Mubende), Maj Gen Pecos Kutesa (in charge of army doctrine), Maj Gen Benon Biraaro, Brig Geoffrey Muheesi, Brig John Mugume Chaaga and Brig Steven Kashaka, among others, have to salute and pay homage to Mbadi, their new boss. Many have argued that this would not be strange, citing Maj Gen Mugisha Muntu, now FDC president, who was elevated from colonel to major general, jumping one rank, upon being named army commander in 1989. But put in context, Muntu had been Director of Military Intelligence and was deeply involved in NRA’s guerrilla war heroics alongside his comrades. Mbadi’s story is not much different from that of his colleagues, major generals Fred Mugisha, David Muhoozi and Brig Leopold Kyanda. Fred Mugisha, who joined the army in 1984, later headed the Artillery unit at Masindi from 2005-2011. He was later promoted to major general and deployed in Somalia where he is reported to have performed exceptionally well. Upon his return from Somalia last year, he was appointed Joint Chief of Staff, replacing Maj Gen Robert Rusoke. The latest appointment makes him head of a previously non-existing National Counter-Terrorism Centre. On his part, Brig Leo Kyanda was, by 1994 Lt Gen Ivan Koreta’s driver. He was later absorbed in the then Presidential Guard Brigade (PGB), where he rose to become its commander, before moving on to another prestigious job as Chief of Military Intelligence (CMI). When he was removed and sent to the US as a military attaché, many commentators believed he had fallen out with the commander-in-chief, but he returned a couple of years later to take up a new appointment as Chief of Personnel and Administration. Now he is Chief of Staff, Land Forces. 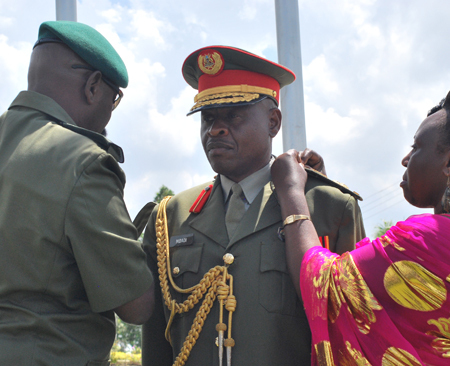 Maj Gen David Muhoozi, now commander of Land Forces (number 3), joined the army in 1985. A lawyer, Muhoozi rose through the ranks to command the Mechanised Regiment in Masaka and later the newly-created Air Defence Division in Nakasongola. Both units fall under the Special Forces Command (SFC). The feeling in the army is that one of these rising stars, i.e. Maj Gen Wilson Mbadi, Maj Gen Fred Mugisha, Maj Gen David Muhoozi and Brig Leopold Kyanda, in addition to Brig Muhoozi Kainerugaba, is being groomed to become Chief of Defence Forces. Because of his age, which places him outside the new generation of leaders taking charge of the army, and the fact that he didn’t participate in the NRA bush struggle, Gen Edward Katumba Wamala is considered a safe but transitional choice. With David Muhoozi as Commander of Land Forces, Kyanda as Chief of Staff (Land Forces) and Mbadi as Joint Chief of Staff, the bush war veterans have all but exited army leadership. A new team of younger generals has taken charge and they owe maximum loyalty to President Museveni - the kind of loyalty he is unlikely to get from bush war historicals such as Sejusa, Henry Tumukunde or Elly Tumwine, who nurse a certain sense of entitlement, having fought alongside the president in the bush. Moreover, not only are Kyanda and Mbadi, in particular, of the same generation as Brig Muhoozi Kainerugaba, they have both served as Museveni’s aides, which brings them even closer to the commander-in-chief. For these new brooms to come in, the likes of Gen Nyakairima and Ivan Koreta had to give way. The outgoing CDF, one of the young graduates who joined the bush war in the early 1980s, was reportedly unhappy at the conduct of Brig Kainerugaba, among other things. Following a donor-funded restructuring exercise, UPDF was divided into three service forces – Land, Air and Reserve. However, along the way, President Museveni added another service - the Special Forces Command (SFC), which his son was appointed to command. As overall commander of the army, the CDF calls meetings with the commanders of these forces, who until the latest changes included Katumba Wamala, Sam Turyagyenda and Muhoozi. But our sources in the army indicate that Muhoozi at times arrived after the CDF, which is considered irregular in the army, given their ranks, and this didn’t go down well with the boss. A year or so ago, Aronda asked to retire. It was not clear why. His situation became even more complex when Gen Sejusa, in his controversial missive, claimed that Aronda was one of the top officials that were not supportive of the “Muhoozi project” and thus targeted by purported assassins. As CDF, Aronda came out strongly to deny Sejusa’s claims. Meanwhile, as Aronda’s military star appeared to fade, Police chief Gen Kale Kayihura’s shone ever brighter. An NRA-era army officer, whose loyalty can still be counted on, hence the promotion to general. In fact, Kayihura was widely expected to replace Aronda. However, the leaking of the Tinyefuza outburst could have forced a change in tact on the part of the appointing authority. The overall head of the army, Gen Katumba Wamala, and his deputy, Lt Gen Charles Angina, served in Obote’s UNLA. They are both fine professionals and their experience blends well with the younger officers mentioned above. Besides, Wamala and Angina help Museveni answer critics who have been claiming the military is headed by westerners. In reality, however, the army leadership has shifted from commanders of the bush war-era to commanders of the Brig Muhoozi-era.